The report “Nut Ingredients Market by Type (Almonds, walnuts, Hazelnut, cashews), by Application (Confectioneries, Dairy products, Bakery products, Snacks & bars, Desserts, Cereals, Beverages & Region - Global Forecast to 2019”, defines and segments the nut ingredients market, with analyses and projections of the market size in terms of value and volume. It also identifies the driving and restraining factors of the market, with analyses of trends, opportunities, restraints, challenges, and burning issues. The market has been segmented and its size has been estimated and projected on the basis of key geographical regions such as North America, Europe, Asia-Pacific, Latin America, and Rest of the World (RoW). Browse 105 market data tables and 61 figures spread through 188 pages and in-depth TOC on “Nut Ingredients Market by Type (Almonds, walnuts, Hazelnut, cashews), by Application (Confectioneries, Dairy products, Bakery products, Snacks & bars, Desserts, Cereals, Beverages) & Region - Global Forecast to 2019"
The nut ingredients market is growing with the increasing demand and rise in consumption of health foods, which include confectioneries, dairy products, bakery products, snacks & bars, desserts, cereals, and beverages. The mentioned food products are being innovated and developed with the inclusions of various nut ingredients. The growing retail environment, changing consumer tastes, and preferences in the form of natural healthy food and organic food, growth of middle-class, and urbanization contribute to the growth of nut ingredients in emerging countries such as India and China. 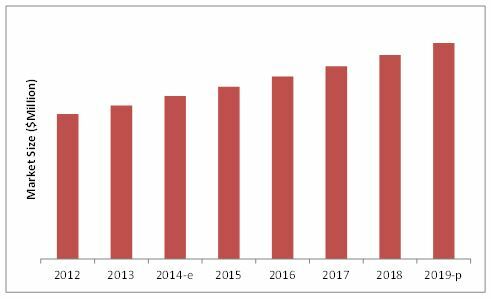 The nut ingredients market is projected to reach $22,642.1 Million by 2019, at a CAGR of 5.8% from 2014 to 2019. The Asia-Pacific market is projected to be the fastest growing by 2019. The report provides qualitative analyses of the prominent market players and their preferred development strategies. The key nut ingredient suppliers in the market identified in this report are Archer Daniels Midland Company (U.S.), Olam International Limited (Singapore), Barry Callebaut Group (Switzerland), Kerry Group (Ireland), and Kanegrade (U.K.).